By D Magazine | 11 years ago As the honorary consul to Spain, Janet Kafka’s job is to promote all things Spanish. It’s also her passion. Peek inside Janet and Terry Kafka’s Spanish-influenced, white stucco retreat. Plus: A fabulous dinner party at home. By D Magazine | 11 years ago From chairs to chic hotels to vintage plumbing fixtures, our annual list of what makes Dallas stylish and well-designed keeps getting better. By D Magazine | 11 years ago Original blueprints in hand, Mark and Kelly Bunting made sensitive updates to their 1920s-era Hal Thomson-designed house, transforming it for modern life. By Amanda Tackett | 11 years ago "Gravity" is a word with mulltiple meanings. There’s "gravity," as in the nature of falling objects. And then there’s "gravity," meaning magnitude. Amanda Tackett has become well-aquainted with both. By Christine Lieb | 11 years ago Craft pastry chef Shannon Swindle’s desserts are notable for their all-natural fruit sweeteners and vine-ripened berries. 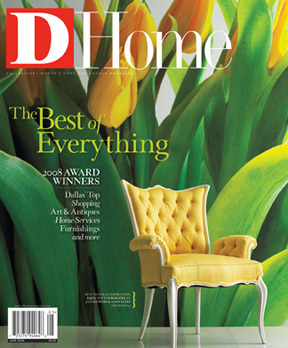 By D Magazine | 11 years ago Bring some summer color to your home with these beautiful finds. By D Magazine | 11 years ago Traditional items get a modern (and unexpected) facelift. By Peggy Levinson | 11 years ago Honesty is always the best policy, and that goes for the latest design trend: one-of-a-kind, artist-made home accesssories. By Rebecca Sherman | 11 years ago Quilting has long been considered women’s work. No so anymore. Richard Larson, a former ball gown designer with a penchant for bling, is one of the top quilters in the country, and he lives in Plano.